Time for another round of Yvo’s Shorties! This time around two stories I highly enjoyed for different reasons… The novella And Every Morning The Way Home Gets Longer And Longer by one of my favorite authors Fredrik Backman and a story I had to put on hold the first time around but highly enjoyed: The Enchanted by Rene Denfeld. I think most of you are already aware of the fact I’m a huge fan of Fredrik Backman‘s work… I decided to pick up this novella first before hopefully diving into the Beartown sequel next month. Novellas can go either way for me, as I normally prefer a more developed story, but there are exceptions where I’m able to connect to a short story in the same way. And Every Morning The Way Home Gets Longer And Longer is one of those exceptions. Not only is it good to see Alzheimer in the spotlight, we also see its effects on both the person itself and those close in a refreshing way. This novella has an almost surreal touch where memories and the real world overlap and exist at the same time. 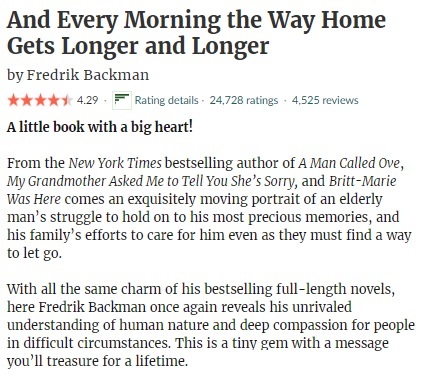 I love the way Fredrik Backman uses the prose and memories to help understand what it would be like having a fading memory. Past and present are liquid as we see the grandfather, his son and grandson in different stages of their life in such a way that erases all boundaries. The representation of the grandfather’s memories as a square where persons and objects alike are incorporated is fascinating… Especially how the square changes over time as Alzheimer starts taking over his brain. 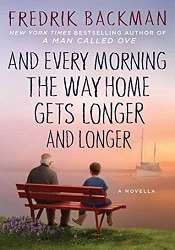 It’s a wonderful and heartbreaking family focused story that is well worth your time. I remember first trying to read this story a few years ago and being unable to connect to the magical realism elements of the story… It really shows that there is something as the right or wrong time to pick up a book, because this time I was fully mesmerized by this magical story. The Enchanted isn’t for everyone and if you are not a fan of magical realism I won’t suggest reading it. If you are open to the genre though, this story will prove to be a little gem. 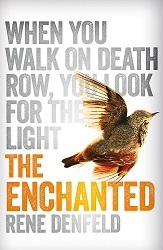 The story behind The Enchanted is actually quite dark, as the main setting is inside Death Row of a maximum security prison. We get to know some of the darkest and most dangerous criminals in a very special way, and it’s an interesting as well as very disturbing glimpse inside their heads. I love how we hop between different characters in such a flowing way that really helps keep everything connected. One of the voices only has his identity revealed at the very end, but this doesn’t mean the story doesn’t make sense or is harder to follow. No, you will get swept up in the whirlwind that is this magical story and savour each and every single magical realism element that will help soothen the sometimes difficult and disturbing subjects as (child) abuse, violence and mental health. Rene Denfeld did a fantastic job combining the different elements, waving them together in such a way that will leave you speechless by the time you reach the final page. 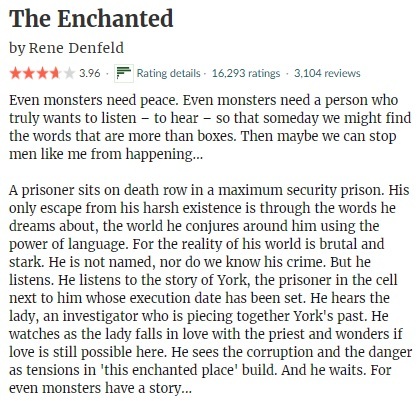 The writing, the magical realism, the characters, the contrast of the fantastical and brutal reality… It’s true that The Enchanted is not for everyone, but the right person will be just as enchanted as I found myself to be.